The USS Tiburon is a proud chapter of Starfleet: The International Star Trek Fan Association Inc. since 2004. Currently, every member of the USS Tiburon is a member of Starfleet. What are the benefits of joining, you ask? Starfleet Handbook and Bylaws are available for download from the Starfleet website, www.sfi.org. 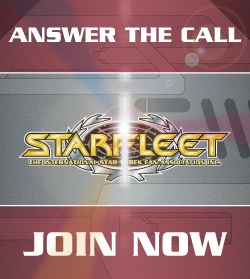 Once you’ve received this information, you will be granted the starting rank of Crewman aboard the U.S.S. Tiburon, and given the opportunity to choose for yourself a career in either Command, the Operations/Engineering/Tactical , or Science/Medical. Another option you will be given is the choice of commissioned (Officer) or non-commissioned (Enlisted) member. After that, you can choose whether you would like to be an ordinary crew member, or if you would prefer to specialize in a specific area of the ship, such as Astrometrics, Sickbay, Engineering, the Armory, Temporal Mechanics, or in one of our many Science Labs. With your permission, you will be added to the ship’s mailing list, and given information to join other lists where members of other ships partake in discussions daily. You will also be subscribed to receive ongoing issues of Communiqué, the quarterly newsletter of STARFLEET, The International Star Trek Fan Association, Inc. Please note that the Communiqué is an electronic newsletter and must be downloaded from the Starfleet Database. You will also have access to a number of academic Scholarships made available to deserving members pursuing their education in medicine, engineering, theater arts, international studies, business and management, veterinary medicine, teaching, law enforcement, or journalism/writing. STARFLEET awards up to $500 per scholarship per year. Member Discounts on goods and services, including OfficeMax, Red Roof Inn, and more. Access to the STARFLEET Academy, which is a set of roughly 1,000 correspondence courses available for free to any member. Access to the STARFLEET Marine Corps, for members looking for get more involved in the paramilitary aspects of Star Trek. Access to the STARFLEET Department of Technical Services, for members who love the technology and ships of Star Trek. And the cost of joining? If all of this sounds appealing, and you’re ready to stop reading this endless web page and actually JOIN US, just click the recruitment poster and don’t forget to choose USS Tiburon from the drop down menu under the payment type section!